TARA ISABELLA BURTON is a writer of fiction and non-fiction. Winner of the Shiva Naipaul Memorial Prize for Travel Writing, she completed her doctorate in 19th century French literature and theology at the University of Oxford and is a prodigious travel writer, short story writer and essayist for National Geographic, The Wall Street Journal, The Economist's 1843 and more. She currently works for Vox as their Religion Correspondent, lives in New York, and divides her time between the Upper East Side and Tbilisi, Georgia. The New York Times, "17 Refreshing Books to Read This Summer"
Vulture, "18 Books We Can't Wait to Read This Summer"
Refinery29, "Brilliant Books to Bring to the Beach This Summer"
O: The Oprah Magazine, "Top Books of Summer"
People, "The Best New Books"
New York Post, "The 20 Best Reads for Your Summer Break"
Popsugar, "Best New Books for June"
Brit + Co, "12 Page-Turning New Books to Read in June"
"Diabolical...A wicked original with echoes of the greats (Patricia Highsmith, Gillian Flynn)." "Sharp as a shard of broken mirror...a formidable burlesque by Tara Isabella Burton. Her obvious model is Patricia Highsmith's Tom Ripley [but] Burton's tale has a great deal to say about the very tangible conventions of our time. Its superb dialogue and cutting sense of humor help it glide irresistibly toward the unnerving moment when Louise has to decide whether to kill again." "Dark, stylish...Burton's exceptional character work further elevates the tale; every individual is both victim and villain, imbuing their interactions with oceans of emotional subtext and creating conflict that propels the book toward its shocking yet inevitale conclusion...At once a thrilling and provocative crime novel, a devastating exploration of female insecurity, and a scathing indictment of society's obsession with social media." "Fans of the cult classic Poison Ivy will appreciate the mousy girl-wild girl dynamic on display in Burton's fiendishly clever debut...An ingenious dark thrille rin the Patricia Highsmith Tom Ripley mode...This devious, satisfying novel perfectly captures a very narrow slice of the Manhattan demimonde." "Last summer, you read Jessica Knoll's Luckiest Girl Alive. You relish bad-girl thrillers fueled by toxic friendship, bad choices and exclusive parties. This summer, try Social Creature...Deliciously dark...Glorious fun." "This fast-paced, stylish, dialogue- and character-driven debut...will definitvely ensnare readers. Diabolically playing on what we think we know about others and what we reveal about ourselves in the social-media age, it will give readers the creeps, too." "Pulsing energy, polished language, perfectly drawn characters." "Burton has a gift for crafting suspenseful scenes while giving Louise and Lavinia each a fully formed inner life that makes them unforgettable." 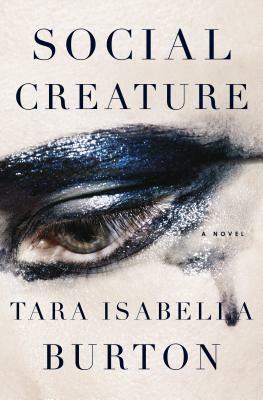 "Social Creature is getting comparisons to novels like Gone Girl for good reason. The gritty thriller mixes the glitz and glamour of NYC with the darkness of murder, jealousy, and a lethal friendship between two young women." "This book is dark and disturbing, but totally compelling. I've never loved such unlikeable characters more." "Party Monster meets The Talented Mr. Ripley...Mysterious and addictive." —Fodors, "The 22 Best Books to Read on Your Summer Vacation"
"One of the most darkly shimmering books I've read this summer." "I inhaled Social Creature, which is like if Gossip Girl did a whole season in the mode of The Talented Mr. Ripley." "A psychological thriller that echoes and updates Patricia Highsmith, with Burton using ever-present social media as an ingenious plot device." —BBC, "10 Books to Read in June"
"A tale of wicked obsession...chilling...demands to be binge-read." "Exactly the kind of book you have been looking for this summer (and every summer for that matter): a twisty, glamorous, hard-as-nails-but-also-polished game of murder and identity...Feels like some unholy matrimony between Fitzgerald and Highsmith." "Lavis and wild and bohemian, Social Creature swept me up in its spell, spun me round the streets of New York and left me wanting moore. This book is ALL THAT JAZZ and then some." "One of those rare literary thrillers that doesn't sacrifice one element for the other. It's fresh, fearless and exciting."